As my first post under my new blog name, I thought i’d share a little about something I’m still amazed I get paid to do! Every now and again I get to take the ICRAR outreach telescopes out to play with a few keen astronomers. The post below first appeared as part of the Australian Science Communicators (ASC) newsletter earlier this year. 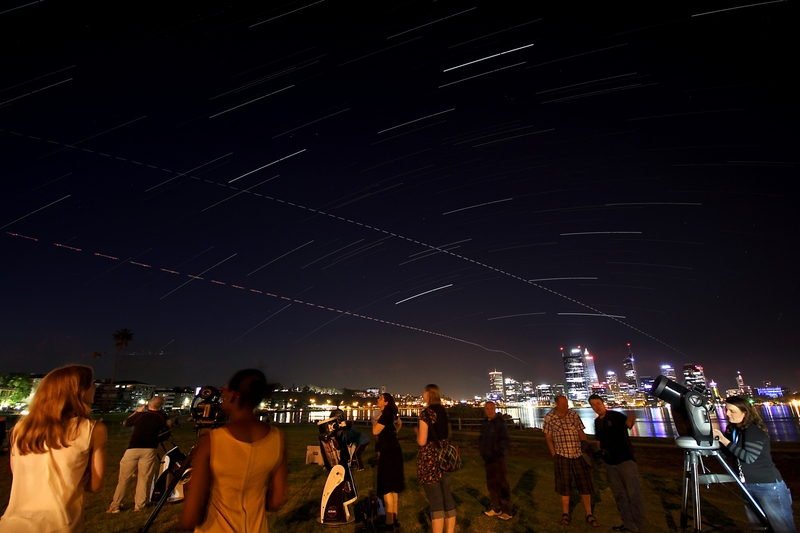 ICRAR’s Guerrila Astronomers on the Perth foreshore, with International Space Station and stars in view. Credit: Dr Brad Warren. I have a confession – I love astronomy. Something about it has fascinated me ever since I can remember. Understandably then, it’s something I am very passionate about. This is why I was quite taken aback when I heard “People aren’t interested in looking through telescopes anymore,” during a session at the recent ASC National Conference. From a respected astronomer no less! Luckily for me and my love of astronomy, her experience couldn’t be further from my own. As part of my role in the Outreach and Education team at ICRAR I take a lot of telescopes to a lot of places and people are always interested to look through them, at them, or just talk about them. One of my favourite outreach strategies is the idea of ‘Guerrilla Astronomy’ – taking a telescope somewhere people will least expect it and introducing them to astronomy with no advertising or attempt to gather an audience. Myself and a band of ICRAR’s professional astronomers take a small (but still impressive looking) telescope or two out to the side of a bike path, to the middle of the CBD shopping precinct, or to another outdoor event and simply stand next to our telescopes talking to anyone that comes near. People always come near, and the result is something that never ceases to remind me why I do what I do. From the woman on her evening jog who got straight back in the car after seeing the Moon to go get her kids; to the children who wont let anyone else have a turn because they are so mesmerised by the Orion Nebula; through to a member of the public helping his elderly mother take her first close up look at Jupiter and its moons, and her gasp when the image became clear to her through the eyepiece. Talking with the astronomers who join me on these evenings, we have so many more positive engagement stories like these. To me, this kind of work is the most important and most interesting part of science communication – engaging with the unengaged and giving them a positive experience of science to take away. There’s probably a large combination of things that make these events so successful – the unexpected experience, and therefore no expectations of what will happen, us being conveniently located where people are already, and in the evening when there’s sometimes a bit more time to spare. But I like to think that the telescopes themselves play a big part in it – they’re an ingeniously simple piece of machinery (just a couple of mirrors and a lens when you get down to it) that pack a big punch and make the previously invisible, visible. Nothing beats seeing the red spot on Jupiter in person ‘for real’ and knowing that the light has travelled from the depths of the Sun where it was created in a nuclear reaction, all the way out to Jupiter (741 million kilometres) and then bounced off right back into this telescope and then your eye. Or maybe that’s just me? I’ll admit, sometimes it is frustrating the first question is ‘How much is it worth?’ but there are always more questions, and I like to think that they’re only asking because they think it’s so cool they want one too! Nevertheless, the benefits to me, to ICRAR, and our astronomers stemming from Guerrilla Astronomy are numerous. It never ceases to inspire a researcher to be told their life’s work is utterly fascinating by either a 5 or 75 year old, and they get told often and emphatically at these impromptu events. We’ve also had so many people follow up for more information, attending our other larger events, or even organising us to visit their school or club for a talk stemming from one simple interaction by the Swan River on a Wednesday night. A recent Guerrilla Astronomy event had over 150 people look through our telescopes over the course of two hours, without us even having to put a sign out! And now a short update! If you’re in Perth and want to join us on a Guerrilla Astronomy, we usually Facebook and Tweet (www.facebook.com/icrar, @icrar) in the afternoon that we’ll be out that night. I enjoyed all your Murchison blogs, Kirsten. I look forward to keeping up to date with ICRAR through this site.